An aeroplane is an immensely complicated piece of technology and the consequences of an engine or equipment failure could easily be fatal for the pilot and crew and possibly anyone else unlucky enough to be caught up in the ensuing crash. Aeroplanes are easily damaged by hard landings and especially by being riddled with holes by machine gun bullets or having chunks blown away by cannon shells. mechanics to service and repair engines. armourers to service guns and replenish ammunition. fitters and riggers to service and repair the air frame,control systems and instruments. R/T fitters and electrical artificers to service and repair the electrical systems and radios. All were vital in maintaining an aircraft in battle worthy state and it was by no means a safe business even in peace time. It was not unknown for unwary crew to walk into spinning propellers as engines were run up and much of a planes fixtures and fittings could also be lethal. To name but a few, World War II fighters contained a potent cocktail of explosive material including aviation fuel, pressurised oxygen, pressurised glycol, explosive ammunition and/or bombs and pressurised hydraulic systems containing hot oils. During the height of the Battle of Britain the Spitfires based at RAF Hornchurch were often participating in three or even four sorties a day during which they were thrown around the sky to the limits of their airframes and engines. Often they would return battle damaged. During this difficult period a few extra minutes servicing an aircraft could make the difference between it being caught on the ground and a sitting duck during an air attack or in the air and actively having a crack at the attackers. Stinting on a service or missing something vital could, however, effectively sign a pilots death warrant. On at least 10 occasions during the Battle of Britain, RAF Hornchurch was subjected to bombing, sometimes two or even three times on a single day. Throughout these raids RAF Hornchurch struggled to keep its flightways open and continue to fly off its aircraft to do battle. The mechanics, artificers, armourers and riggers worked assiduously throughout these raids even as the bombs dropped around the dispersals in which they worked on aircraft requiring re-fuelling, re-arming and servicing. Essential maintenance, large repairs and vital tests often had to be undertaken at night in blacked out hangars in order to have planes ready for action during the day. The Erks had little rest. The pilots almost universally had nothing but respect and admiration for the Erks on whom their own lives relied. Most built up an easy familiarity with the maintenance crews and didn't mind too much the inevitable tuts, intakes of breath and on occasion even jibes should a plane be brought back with holes in it or, heaven forfend! actually pranged in a landing accident. For their part the Erks took fierce pride in their work and the actions of the pilots whose planes they were responsible for. 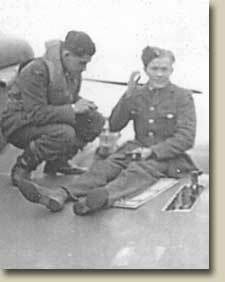 By World War II the RAF's Erks were some of the most professional technicians in the world. Most had passed through specialised apprenticeships or attended the specialised RAF Technical College at Halton in Hertfordshire. By the time that they reached their service squadrons they generally knew intimately the workings and ways of the aircraft and aircraft systems. This technical knowledge was usually far in advance of that known to pilots. Their technical know how was also often put to use making field alterations to aircraft and to draw up solutions to technical defects to be incorporated into the new planes being produced. It was still the dream of many Erks to become pilots and in the inter-war years it was by no means unusual. Indeed their technical knowledge often helped them to become very good pilots. During the Battle of Britain almost a third of Britain's fighter pilots were Sergeants, many of whom had originally served as fitters, riggers and engineers. With the massive demands for man power required in the fighting arms of the services during World War II it was soon common for the Womens Auxiliary Air Force (WAAF) to also train and provide experienced technicians to maintain aircraft. These women proved to be just as diligent, brave, hard working and technically capable as the men alongside whom they worked.